A Mediterranean inspired quinoa salad with juicy tomatoes and cucumbers along with tangy red onions and salty kalamata olives and feta. The Greek style salad, a salad with juicy tomatoes and cucumbers, tangy red onions, and salty kalamata olives and feta in a lemon and oregano vinaigrette, has to be one of my favourites and it is so easy to turn it into a light and yet satisfying meal with the addition of quinoa (or a whole grain) along with some chickpeas! I always enjoy using quinoa in salads like this since it is such a nice source of protein, especially when combined with a bean, and it really makes for a salad that eats like a meal. I particularly enjoy this quinoa and chickpea salad because of all of the wonderful Mediterranean flavours where the juicy tomatoes and cucumbers play brilliantly with the salty olives and feta. Another wonderful thing about this salad is how versatile it is, I always have fun changing up the ingredients and some more that work well are roasted red peppers, sun-dried tomatoes, artichoke hearts and even cool and creamy avocados! Bring the quinoa and water to a boil, reduce the temperature to medium-low and simmer, covered, until the liquid has been absorbed, about 15 minutes, and let sit covered for 5 minutes before letting it cool. 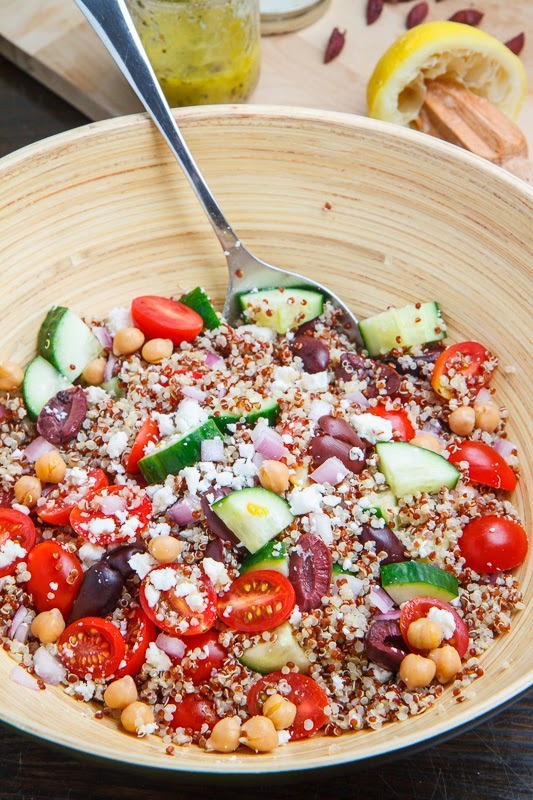 Mix the quinoa, tomatoes, cucumber, red onion, olives, feta and chickpeas and toss in the mixture of the lemon juice, oil, oregano, garlic, salt and pepper. Note: I like my quinoa to be al-dente and not mushy so I use a little less than the commonly called for 2 cups for 1 cup of quinoa; I use 1 1/2 cups of water when I rinse the quinoa and 1 3/4 cups when the quinoa is pre-rinsed. Tip: Cook the quinoa a day ahead to save time. Option: Add other Mediterranean inspired ingredients like roasted red peppers, sun dried tomatoes, artichoke hearts or even avocados. A beautiful salad! So colorful, healthy and delicious. What a great way to change up Greek Salad. Greek style pasta salad is a staple in my household throughout the Summer. Will give this version a try. I could eat that whole bowl right now!! I make something very similar to this. All this needs is some mint! I adore these flavors! I could this everyday! All the bright flavors in this are so perfect for getting back on the healthy track!! I think you forgot the Avocado ???? What a gorgeous, vibrant salad! Thanks for the great recipe. Made it tonight and it was delicious! Delicious! What is the serving size that corresponds with the nutritional values listed? Thanks for a wonderful recipe. I think it will be my new potluck staples! littlelaura: I am glad that you enjoyed it! Each serving should be about 12 ounces. This was sooooo delicious. Oh my god. 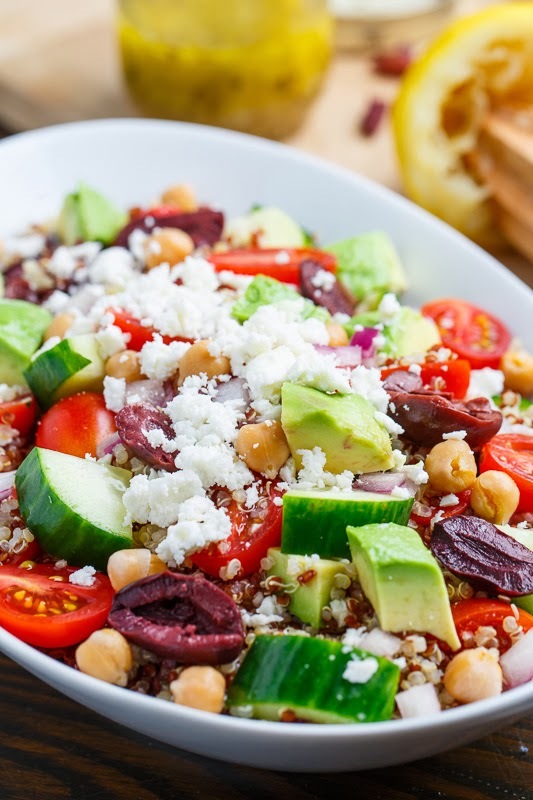 This is amazing – I've been looking for a good greek quinoa salad (mimicking what I get at Whole Foods from the salad bar) and this recipe is it! I love it. I made this salad to take for my lunches this week. It’s very simple and tasty and you can really experiment with your add-ins. I added mint this time, but I could totally see adding avocados one time. With salads like these, I don’t rely heavily on measuring (except the quinoa), and I usually eyeball the veggies. Delicious and healthy!